BEIJING, March 11 (Xinhua) -- When Lei Jinyu went to college 12 years ago, she never expected to return to her home village of Houmenping. 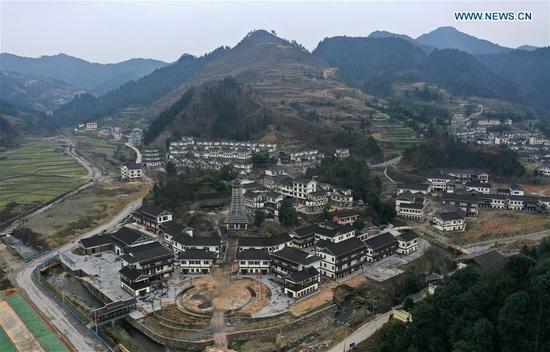 The mountainous village in east China's Fujian Province barely had any modern facilities. A narrow, old pebble trail was the only road leading to the nearest town. "When I was a little girl, I had to trek along the muddy mountain road for more than two hours to go to school in the town," said Lei, 32, head of Houmenping Village. Since the late 1980s, local officials in Ningde, which administers Banzhong Township, have been working to modernize the village by building roads in the township, helping lift villagers out of poverty. In recent years, as the Chinese government continues to pump more funds into rural infrastructure, Lei's hometown, which used to be one of the poorest areas in the country, saw more cement roads and a rising number of cars. These days, villagers are making a fortune by selling online local specialties such as tea leaves, cane sugar and traditional Chinese medicine. Lei is currently in Beijing attending the annual session of the national legislature. The deputy's suggestion this year is boosting tourism by developing local ethnic culture. Casting off poverty is only the first step, she said. "Our goal is to step toward an all-round well-off society." The amazing transformation is part of a broader picture across the nation, where a successful government campaign to build an all-round well-off society has seen countless people get rid of poverty and lead prosperous lives. In 2012, at the 18th National Congress of the Communist Party of China (CPC), China vowed to complete the building of a moderately prosperous society in all respects by 2020, when the gross national product and average income per capita of urban and rural areas will double the amount of 2010. Since 2012, a series of systematic reforms have been implemented across areas such as the economy, politics, culture, society and ecology. In the 40 years since the reform and opening-up policy was introduced, the Chinese government has revised its goal of "building a moderately prosperous society," to "building a moderately prosperous society in all respects," and to "securing a decisive victory in building a moderately prosperous society in all respects," indicating that the goal is gradually becoming a reality. In China, building a moderately prosperous society in all respects covers a variety of objectives in many areas, including economic growth, democracy and the rule of law, culture, people's lives and the environment. As China gets closer toward its goal, major changes have taken place in the country over the past few years thanks to almost 2,000 reforming guidelines since a road-map and a timetable were laid out at the Third Plenary Session of the 18th CPC Central Committee in 2013. Since then, the impoverished population in the country's rural areas decreased from 98.99 million to 16.6 million, meaning more than 82 million people were lifted out of poverty, almost the entire population of Germany. China's economic growth model also shifted from high-speed growth to high-quality growth. The country's economy exceeded 90 trillion yuan (13.4 trillion U.S. dollars) in 2018, accounting for 15 percent of the world's total and contributing more than 30 percent to the world's economic growth. Meanwhile, the average annual income growth stood at 7.4 percent among urban and rural residents, higher than the national economic growth. Social endowment insurance has covered more than 900 million people, and basic medical insurance reached more than 1.3 billion people. In addition, more than 90 percent of disabled children are entitled to an education, and nutritious meals for rural students have covered all poor counties on the national level. In Mabian Yi Autonomous County of southwest China's Sichuan Province, for example, average annual education expenses have reached 200 million yuan in a place with just 220,000 people and a government revenue of less than 400 million yuan. All schools in the county provide free education and rural children are given free nutritious meals at school. These are the changes brought about by equality in China's education system. In 2017, national education investment topped 4 trillion yuan. In the past six years, the government has provided over 1 trillion yuan worth of aid to 620 million students. Despite huge success, building an all-round well-off society in all respects is never without challenges. "We will face a graver and more complicated environment as well as risks and challenges, foreseeable and otherwise, that are greater in number and size," according to a government work report delivered by Premier Li Keqiang at the opening meeting of the annual legislative session. 2019 is regarded as a pivotal year for building a moderately prosperous society in all respects, and the country is on the fast track toward that goal. China has set its GDP growth target at 6-6.5 percent for 2019, according to the report. This is the second time in four years that the country has set a range instead of a specific target for economic growth. "The target is realistic for China's development, and it is a reflection of high-quality growth," said Bai Chong'en, a national political advisor and dean of the School of Economics and Management at Tsinghua University. Maintaining economic growth will not only be good for employment but also provide a sound macro environment for building an all-round well-off society, Bai said. China has continued to boost vitality in the market by streamlining government functions and cutting taxes and administrative fees. This year's report on the work of the government showed that China will reduce the current 16 percent tax rate in manufacturing and other industries to 13 percent, and lower the share borne by employers for urban workers' basic aged-care insurance. The government will also reduce the tax burdens on and social insurance contributions of enterprises by nearly 2 trillion yuan. Zeng Qinghong, a deputy to the National People's Congress and chairman of Guangzhou-based carmaker GAC Group, said the new tax policy would lower the group's taxes by about 5 billion yuan. A series of favorable policies will create a better environment for the development of the real economy. The Chinese government has listed three tough battles that determine the success of building an all-round well-off society, including preventing and defusing financial risks, targeted poverty alleviation, and pollution control. To prevent a local debt crisis, the National Development and Reform Commission re-evaluated subway projects in local cities based on their GDP, government revenue and population, and halted some projects in western inland cities such as Baotou and Lanzhou, due to the incompatibility between government revenue and the amount of money needed for the projects. "China's de-leveraging policies since 2016 have shown an initial effect," said Chen Yulu, deputy head of the People's Bank of China, China's central bank. Macro leverage ratio in 2018 was down by 1.5 percentage points, Chen said. Another key to all-round prosperity is poverty relief. In 2017, Chinese localities waged war on extreme poverty, with additional funds, projects and favorable policies for extremely poor areas. In 2018, with governmental help, Liu Fuyou, a resident of Zhaojiawa Village in north China's Shanxi Province, moved into a new house in the county of Kelan, which administers Zhaojiawa, and became a cleaner. With a variety of subsidies and a pension, his family managed to make almost 30,000 yuan last year. In the southwestern municipality of Chongqing, Yang Qingfu's life on the Yangtze River also saw a big change. Yang used to run a boat restaurant on the Yangtze. Despite its popularity, a lack of pollution-treatment facilities spilled wastewater into the river. To prevent the situation from worsening, the local government subsidized Yang and more than 100 of his peers and encouraged them to go onshore to start other businesses. The change was a result of a meeting on the Yangtze River Economic Belt in January 2016. The meeting required that the development along the river must prioritize ecology and "green development" to respect natural, economic and social rules. The meeting led to the complete stop of polluting projects along the Yangtze. The ongoing legislative session in Beijing also highlighted the need to step up efforts to protect and restore ecosystems. That, in addition to a series of environment-related policies in recent years, including an environmental tax, has displayed China's strong resolve to win the war against pollution. "Building a moderately prosperous society in all respects will be a great achievement on the way toward national rejuvenation," said Liu Shangxi, with the Ministry of Finance and a national political advisor. Liu said that it will be a miracle in human history to enable more than 1 billion people to completely get rid of poverty and enter common prosperity. "It will show that a developing country like China can modernize in a way different from Western countries," he said.